That gorgeous kitchen island you’ve been dreaming about? You know, the one with the overhang designed for seating? Well, it needs some stools that are equally beautiful. But before you scoop up the first set of drool-worthy stools you see, think about how often you’re going to use them. If you envision lots of leisurely breakfasts and late-night gatherings while perched on your counter stools, comfort is key. Opt for stools with backrests, and pay attention to details like curved edges and ergonomic design. Padded seat and back covers are a plus. Here are some of our picks for counter stools that look as good as they feel. 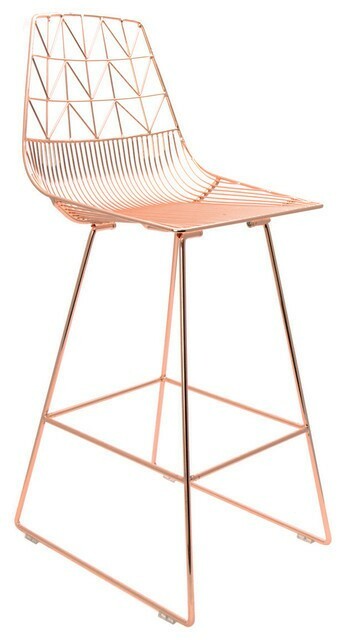 Shiny, modern, and cool, these copper counter stools will be like jewelry for your kitchen. You can also customize your stools (and make them comfier) with a seat cover, which are available in five colors. When you’re serious about your stool lounging time, strategic padding is key. Padded, woven-felt covers from Blu Dot slip on the backs of their wooden counter stools, providing some strategic softness and support that will allow you to further extend late-night chats over a bottle of wine. The covers are available in nine shades, so, depending on the color, they also add a pop of color or texture to the space. The curved backrest of these wood-framed counter stools is at once sculptural and supportive. Designed by South African furniture designer John Vogel, the stools feature the webbed seats he’s known for. Each seat is hand woven in either jute or a black synthetic material. With its minimalist design, this stool looks great in sleek, modern kitchens. And with its dark yellow, padded leather seat, it will pop it black or white spaces. 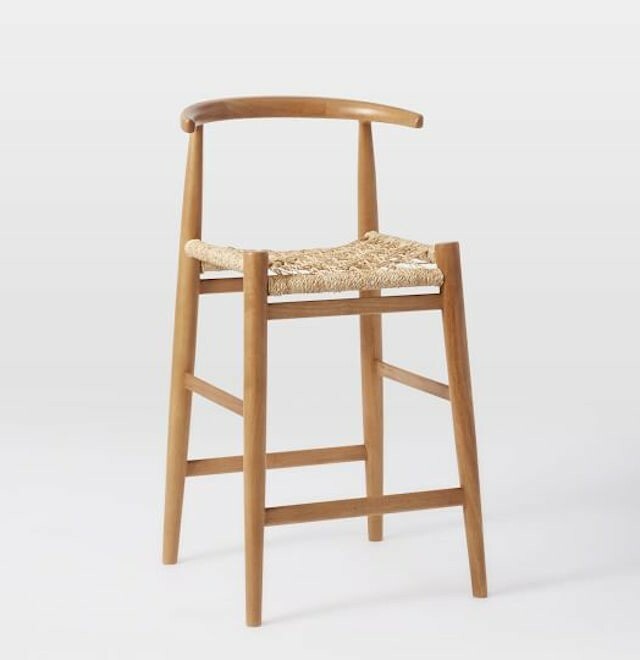 The simple, elegant shape of this stool is reminiscent of the iconic Series 7 chair designed by Arne Jacobsen in 1955, and it feels just as fresh now. The ample back support and curved seat of the smooth plywood stool make it a comfortable choice for serious sitting. This stool design debuted at the buzzy Standard Hotel in Miami, so it already has cool cred. The woven vinyl cord stool is handmade and comes in a plethora of shades and finishes that will work with pretty much any color palette. The striking shape of this stool by Aristeu Pires makes it a piece that you want to have in your home for aesthetic reasons, and its ergonomic design makes you want to settle into it for reasons of personal comfort. Crafted of Jequitiba wood, the sturdy stool features a cushy seat covered in black or brown leather. A molded plastic seat with a waterfall edge makes these stools more comfortable than you’d imagine, and the solid wood base and metal support make it a hardy choice for such a high-traffic area. The mid-century modern design works well with contemporary kitchens, or it would be a nice juxtaposition with more classic styles. Sometimes modern design is equated with being cold and uncomfortable. This stool shatters those misconceptions with its cushy, curved grey wool seat. The spare design means it would fit well in a minimal kitchen or as an understated piece in a space with a bold, graphic floor or backsplash. Available in a variety of custom colors, we used the brilliant persimmon painted maple Colt barstools in a freshly renovated kitchen of a client of ours in Greenwich recently and for good reason (besides great styling). An instant classic evoking the timeless appeal of Scandinavian and Shaker designs, the bespoke counter and kitchen stools from O&G Studio boast both scale and comfort – making them a minimal, yet bold counter stool option worth considering when looking to pack a visual punch in small doses. Your time and your guests spent in barstools can at the least be a tad bit hazardous to your overall general health, even when seated for short spans of time, especially if there’s a lack of general physical fitness in daily life. Scientists and researchers suspect this thanks to some genius tests performed by the likes of the British Journal of Medicine. After over a decade of researching the musculoskeletal dangers of kitchen stools and chairs, it seemed obvious to lead researchers that too much time spent in chairs and kitchen stools was more than likely to cause even the smallest bouts of back pain. Whether that means being seated at your favorite watering spot’s barstools or at work in your office or anywhere in your home, taking care of your body is just as important as making sure your home is expertly decorated. And if you spend most of your time at home seated at your favorite counter stool, chances are you’re more than likely to suffer from back issues if it’s not an ergonomically tuned counter stool. And that all starts with your counter stool ideas. Even for a small kitchen, you should study the best counter stool ideas that feature innovative ergonomics to optimize your kitchen stools. However, there are still a few essential steps you can take to improve the effect of kitchen stools on your back — and the rest of your body. First and foremost, make sure that your barstools keep you comfortable and supported the second you take rest in one. Selecting the right kitchen stool will work to help improve your comfort, general health, and overall enjoyment. There are a few things to consider when shopping for the best kitchen stools with maximum comfort- especially if you want one that can prevent or reduce the chances of future back pain. Make back support your primary consideration when considering counter stool ideas. Quality and smartly designed kitchen stools should feature lumbar support, as well as cushioning or contours to help you sit up straight while alleviating the pressure on your lower back that ineffective counter stools often can’t offer. And more importantly, kitchen stool are not a one-size-fits-all piece of furniture, so it’s essential to find counter stools that offer adjustable features like height, back support angles, and armrests. The best counter stool ideas might be as easy as two or three different kitchen stools used in rotation, including or used in simultaneously with a destabilizing cushion. Throughout your home, you should have standard chairs and kitchen stools, both of used in combination with a cushion for plenty of comfort. Because there are plenty of other places you can sit from time to time. This variety is key in making the best out of your kitchen stools. And, if you still want beautifully designed bar stools 2019, by all means — invest in brilliantly designed counter stools. You may worry about the cost at first – that is, until you sit in it. Above all, take the benefits of a smartly designed counter stool 2019 seriously. True health and fitness are not compatible with a seriously uncomfortable counter stool 2019. If you can’t afford the best kitchen stools take preventative measures make your time relaxing at home as comfortable as it can be.